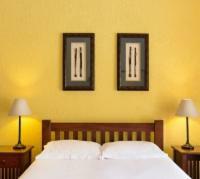 Amadeus Garden offers bed and breakfast accommodation in Victoria Falls. The lodge is set in a spacious green garden with a swimming pool, and is located within walking distance of the Victoria Falls. Amadeus Garden is the right choice of accommodation for you if you prefer the atmosphere of a small lodge rather than a hotel. Conveniently located 25 km from Victoria Falls Airport and with just 11 rooms, Amadeus Garden is a safe and trusted guest house since 1999. Pool Side Twin Room (2 Sleeper) Sleeps 2 Includes: B & B Rooms / Units: 2 Twin en-suite room. En-suite shower and WC, ceiling fan, safety box, international 230 Volt plug. 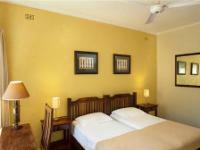 Pool Side Twin Room (3 Sleeper) Sleeps 3 Includes: B & B Rooms / Units: 2 Twin en-suite room. En-suite shower and WC, ceiling fan, safety box, international 230 Volt plug. Family Room Sleeps 4 Includes: B & B Our family room can sleep 2 adults and 2 children under 10 years of age. Amadeus Garden is 1.2km from the centre of Victoria Falls , the nearest airport 18.7km (Victoria Falls International Airport).